It was just over a century ago that people accustomed to using candles and kerosene lamps first caught sight of incandescent lamps. When incandescent bulbs came on the scene in the 1880s and 90s, they became the ideal light source except for their poor energy efficiency. Since the 1970s, many more efficient light sources have been introduced but none as innovative as the LED. improvements, combined with the 3 trends listed below, customers are more willing to upgrade to LEDs across a variety of applications. 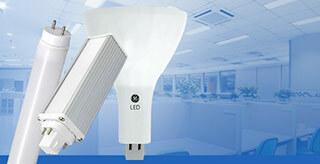 In the early stages of LED development, industry experts often quoted Haitz’s law: “Every decade, the amount of light generated by LEDs increases by a factor of 20, and the cost per lumen falls by a factor of 10.” Although this trend appears to be leveling off in 2016, improvements continue. We are seeing streamlined mechanical and optical designs coupled with more efficient LED packages (including phosphors) and more efficient electronic drivers. Remember the very cool bluish white color of the early LED replacement lamps? Even the early holiday string sets were heavily weighted with bluish overtones. Today’s LEDs provide pleasing cool to warm tones, along with enhanced red and white, while maintaining high efficacy levels. A good example is the new GE TriGain™ phosphor which offers improved narrow red band performance, resulting in reds that are sharper and cleaner, enabling richer picture quality and increasing the color range for backlit displays. Fixtures are becoming smarter. For example, in indoor lighting, there is technology focused on indoor positioning systems that can send high frequency modulation signals through the LED. These signals can be picked up by a smartphone or tablet, and provide the precise location of customers within a facility. Outdoor wireless control systems now offer remote operation and monitoring of all fixtures through a web-enabled central management system that collects data from sensors and cameras. So where does the LED go from here? While many customers just want to be able to turn their lights on and off, many customers want LED systems to be smart and efficient. Today’s LEDs are over twice as efficient as some produced only 5 years ago. This trend should continue as new technologies are developed, leading to an increase in efficacy and a reduction in production costs. As the cost of LEDs become comparable to that of compact fluorescents, the adoption of even more LED lighting should be accelerated. designnews.com: What’s Going to Drive the Future of LED Lighting?